Spring migration in Ohio is justly famous, but fall migration lasts longer - almost half the year - and involves more birds, since the surviving adults are joined by many more young birds hatched during the summer. Magnolia Warbler at Magee Marsh, Ohio, in mid-September. This site is world famous for its warblers and other migrants in May, but the whole region is also visited by many migrants throughout the fall season. July: The first southbound shorebirds appear in late June, and by early July adults of several migratory shorebird species are numerous here. Juveniles of some species begin to appear before the end of July. The latter part of this month also sees large numbers of swallows staging in some areas, especially near Lake Erie and around some large reservoirs, flocking and feeding prior to their southward migration. Swallows, like this juvenile Barn Swallow, gather in large flocks in late summer before they start their southward migration. August: Shorebird migration is in full swing throughout this month, with juveniles of several species outnumbering adults, especially toward the latter part of August. A few summer resident species begin to depart very early; for example, Orchard Orioles are mostly gone by late August, and numbers of Yellow Warblers drop sharply by the second half of the month. Staging numbers of swallows diminish by late in the month. 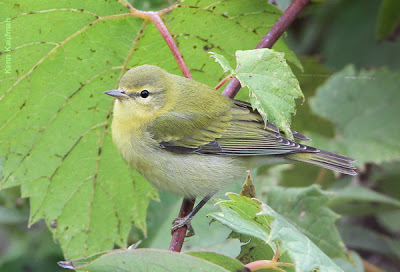 The first migrant warblers from farther north usually show up in the first week of August, and by late in the month warblers are passing through in good variety and fair numbers. Along with the warblers, some other songbird migrants such as thrushes and vireos are moving in late August. Right at the end of August and beginning of September, there may be a notable movement of Common Nighthawks. September: The best month for seeing a wide variety of migrating songbirds. Warblers are most numerous and diverse during the first three weeks of the month, and so are flycatchers. Thrushes and vireos are moving, and by late in the month, sparrows are also migrating. Shorebird migration continues strongly throughout September. Blue-winged Teal and Green-winged Teal appear in large numbers now, but most ducks are later migrants. Fall hawk migration isn't a major feature in Ohio, but September is the best time to see a passage of Broad-winged Hawks. Broad-winged Hawks, more strongly migratory than many other birds of prey, pass through Ohio mainly in September. 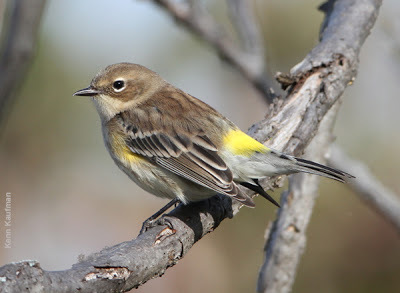 October: By now the warbler migration is well past peak, although a few species, such as Yellow-rumped Warbler, are moving strongly in October. Sparrow migration has picked up, and will be a major feature of the month. Many short-distance migrants have their peak passage in October: Golden-crowned and Ruby-crowned Kinglets, Hermit Thrush, Winter Wren, American Pipit, and others. Shorebird migration continues strongly through the first half of the month, but numbers and variety drop off thereafter. Waterfowl migration is picking up, and many dabbling ducks are numerous throughout most of October, although geese, swans, and diving ducks tend to peak later. After most warblers have gone south, Yellow-rumped Warblers continue as common migrants through October and into November. November: Waterfowl migration is the main feature of November, with many of the ducks and geese, plus Tundra Swans, having their peak numbers this month. Some other waterbirds, such as Common Loon and Horned Grebe, peak at the same time. Sparrow migration is still going strong, but most other groups of songbirds have mostly passed through by this time. Rusty Blackbirds pass through in largest numbers during late October and early November. Especially along Lake Erie, very large numbers of Bonaparte's Gulls and other gulls are gathering at this time. Some wintering birds, such as American Tree Sparrow, Snow Bunting, and Lapland Longspur, have their major arrival in November. December: Almost all species are past the peak of their migration by the first of December, but surprising numbers of stragglers will continue to move during this month. Some wintering species, such as Common Goldeneye, may not be present in full numbers until December, and some rare northern gulls may not show up until then. Sandhill Crane migration has been getting later in recent years, with the birds not moving out of staging areas northwest of Ohio until forced out by weather, so their peak passage through Ohio is now often in December. Waterfowl: With a few exceptions, these are mostly later migrants. Several of the dabbling ducks are migrating in September, but only Blue-winged Teal reaches peak numbers then. Most other dabblers pick up in numbers from late September through November, while the main movement of diving ducks is from the end of October into early December. 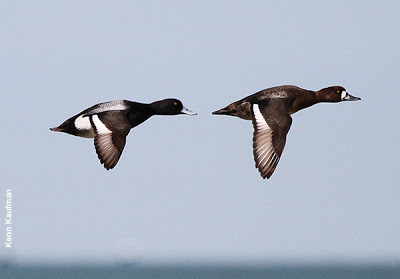 Pair of Lesser Scaup in flight (male on left, female on right): diving ducks such as these tend to arrive or pass through in peak numbers later in the fall than the dabbling ducks. 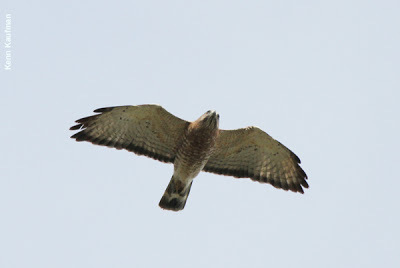 Raptors: Ohio has few well-defined corridors of fall raptor migration. Concentrations are sometimes seen in the Toledo area, where hawks have come down the north shore of Lake Erie and turned southward just south of Detroit. The Lake Erie islands (such as South Bass and Kelleys) may have notable flights of Sharp-shinned Hawks, Cooper's Hawks, and others, island-hopping across the lake. Elsewhere, only small numbers of raptors are seen, as they move on a broad front. Broad-winged Hawks move mainly in September, Merlins mainly in late September and October. A notable push of Red-tailed Hawks may occur in late October and November, while Rough-legged Hawks begin to arrive in early November. Shorebirds: Fall migration of shorebirds is prolonged, with some southbound birds appearing by late June, and some still moving in early December. As a general rule, adults migrate earlier than juveniles, so many species show two well-defined peaks. Within the shorebird group, there is much variation by species. 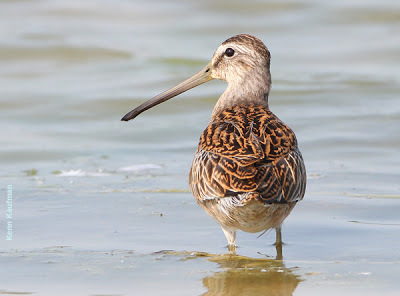 Short-billed Dowitcher is among the earliest migrants, peaking in July and August, while Dunlins are mostly late, peaking in October or even early November. See this post for much more specific information on the timing of shorebird migration. In most shorebird species, juveniles migrate later than adults. This juvenile Short-billed Dowitcher was photographed in late August; adults of the species pass through Ohio mostly in July. Gulls: Purely local movements by Ring-billed and Herring gulls can make actual migrations hard to detect, but patterns emerge for other species. Bonaparte's Gulls are scarce in early summer, but they usually appear in fair numbers along Lake Erie in late July, with numbers building gradually, and then a huge influx in late October or November. Franklin's Gulls are usually found in very small numbers at any time in fall, but major storms from the west can bring small flocks, especially in October or November. Scarce northern gulls such as Thayer's, Iceland, or Glaucous start to appear in November and December. Terns: Most terns are moving in early fall. 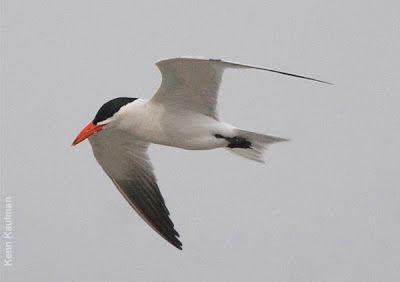 The main passage of Black and Caspian terns is in August and early September. Common and Forster's terns may have their largest movements in September and October, with numbers tapering off through November and a few lingering into December. Although there is considerable overlap, Forster's may be more likely than Common in late fall. Caspian Tern is among the earlier migrants in Ohio, reaching peak numbers in late summer. Owls: The migration of owls is often difficult to detect. We now know from banding studies that significant numbers of Northern Saw-whet Owls pass through Ohio in late October and November. Short-eared and Long-eared owls may arrive for the winter, or pass through, starting in October. Snowy Owls may appear as early as the end of October, but most arrive in December. Flycatchers: Most flycatcher migration peaks in late August and the first half of September. Bucking that trend is Eastern Phoebe, with peak migration mostly from mid-September through mid-October. Vireos: Major numbers of Red-eyed Vireos pass through during September, but they are easily overlooked in the dense foliage. Warbling and Philadelphia vireos also generally migrate through in September. Blue-headed Vireo peaks a little later, in late September and early October. 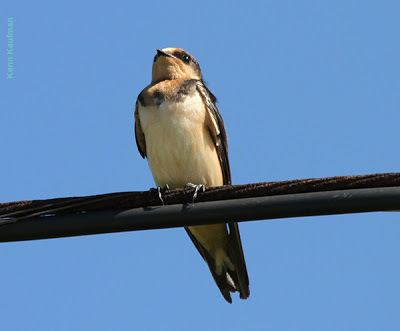 Swallows: The largest concentrations of swallows are actually seen in late July and August, as flocks of Barn, Bank, and Tree swallows gather in favored areas of open country, and large roosts of Purple Martins form at traditional sites. Numbers of most drop off by early September, although Tree Swallows remain numerous into at least mid-October. Following storms with winds from the southwest in late fall, including late October and November, Ohio birders have learned to look for vagrant Cave Swallows along the Lake Erie shoreline. Swainson's Thrush is a very common fall migrant through Ohio, especially in September. Thrushes: Migration of the brown thrushes is centered on September. Wood Thrush and Veery tend to migrate early, and may be actively moving in late August. In September, Gray-cheeked and Swainson's thrushes overlap completely, but Gray-cheeked is less numerous and peaks a little later. 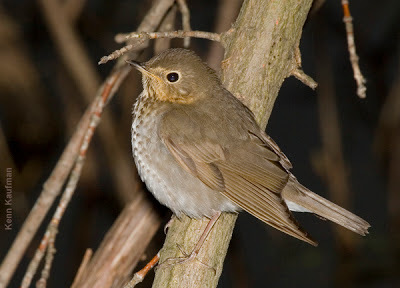 Hermit Thrush is later than the others, appearing in the latter part of September and reaching peak numbers in October. Warblers: September is the biggest month for fall warbler migration. A few individuals may begin to show up away from breeding areas by about the first of August, but such migrants aren't easy to find until about the second week of the month. By the third and fourth weeks, migrants are widespread, and good variety and numbers can be found by the end of August. The migration is strongest during the first three weeks of September. After the first of October, numbers and variety are beginning to drop off. Tennessee Warblers are among the earlier species of warblers to pass through Ohio in fall, often appearing in numbers during the last days of August. Of course, timing of the migration differs by species. 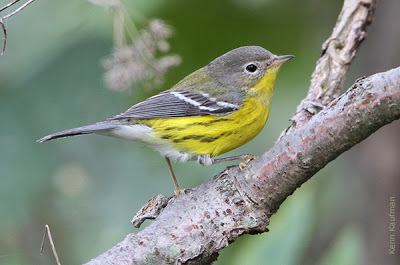 Warblers that come through mostly in the early part of this span include Yellow, Chestnut-sided, Tennessee, Prothonotary, Golden-winged, and Blue-winged warblers, plus Northern Waterthrush. Notably late migrants include Yellow-rumped, Palm, and Orange-crowned warblers, all species that are among the earliest warblers in spring. Yellow-rumped Warblers are very common through October and fairly common through much of November, with some remaining for the winter. Some species such as Black-and-white, Black-throated Green, and Blackpoll warblers have a relatively long season of passage. Blackpoll Warblers may be abundant in late September and early October, but mainly in northern Ohio, close to Lake Erie; these birds are passing through the state on an eastward course, heading toward the Atlantic Coast. 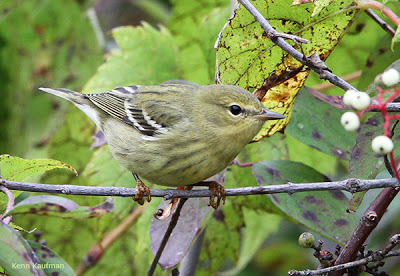 During September and early October, Blackpoll Warblers pass through Ohio in large numbers, heading toward the Atlantic Coast and ultimately toward their winter range in South America. Sparrows: In general, sparrows migrate later than warblers, with the main passage for most species centered on late September and October. Fox Sparrow averages later, moving mostly in late October and November, while the major numbers of wintering American Tree Sparrows arrive in the state in November. 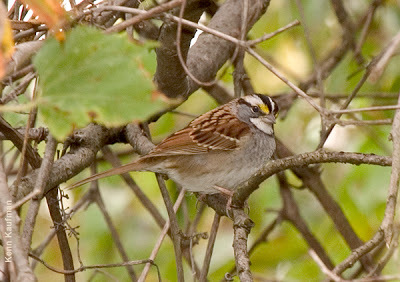 The migration of native sparrows (such as this White-throated Sparrow) adds to the excitement of birding in mid-autumn, from late September through October, after the main migration of warblers. Blackbirds: This diverse family is all over the calendar in the timing of their fall migration. Orchard Orioles begin to leave before the end of July, and many Baltimore Orioles leave before the end of August. The main southward passage of Bobolinks occurs in August and early September, while Eastern Meadowlark migration peaks in late September and October. The most numerous summering species, such as Common Grackle, Red-winged Blackbird, and Brown-headed Cowbird, begin gathering in large flocks in late summer, and their numbers may increase during September and October before they start to drop off in November. Rusty Blackbirds, uncommon migrants from the north, move through mainly during late October and November, with some staying through the winter. Finches: Members of this family are notorious for their irregular migrations. American Goldfinches are common in Ohio all year, but individuals move around a lot, and there may be a substantial migration during October and early November. Purple Finches move south through Ohio every fall, mainly from late September through October, but their numbers can vary a lot from year to year. Pine Siskins are even more variable in numbers, but they sometimes have major invasions beginning in October or November. Other "winter finches," such as redpolls and crossbills, tend to show up later if at all, but their movements are so unpredictable that they are hard to generalize. 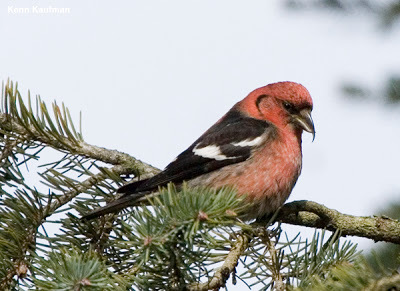 White-winged Crossbills sometimes reach Ohio in winter, but the timing of their arrival is variable and unpredictable. This wonderful overview of the timing of migration was written for BSBO by Kenn Kaufman. To read more of Kenn's thoughts on bird migration in the Crane Creek / Magee Marsh area, visit Kenn's BSBO Birding Blog.